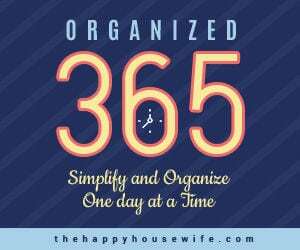 The following is a post by Jami from An Oregon Cottage. 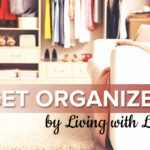 Want a fun and unique hostess, wedding, or birthday gift? 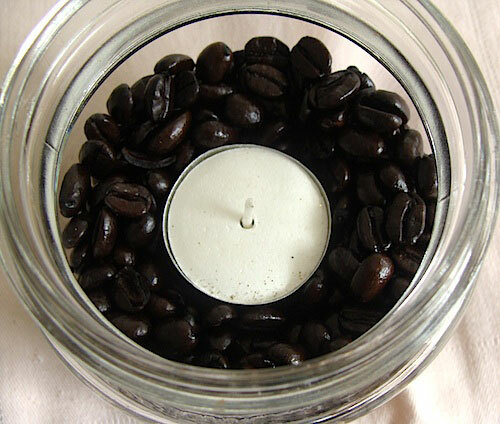 These DIY coffee bean candles are just the ticket. They are quick to make, lovely to use, and they create a wonderful smell. I know, because a friend gave us some for Christmas and we’ve really enjoyed them. 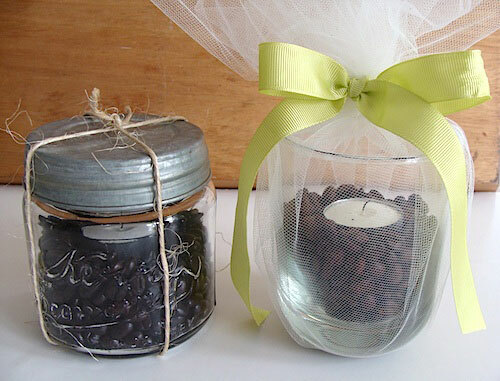 Coffee bean candles are easy to customize by using different containers, flavored coffee beans and wrapping, yet they literally take only minutes to put together. I initially thought that since coffee beans are expensive these might be, too, but I calculated that a cup of beans costs us only about $1.20 (at Costco, we buy coffee for $6.00/pound). Using found containers like canning jars or buying dollar store glasses, these end up being the best of all worlds: an inexpensive, quick, easy and tasteful gift! Two glass containers (2-cup sizes seem best, but it would be fun to experiment). When I think about all the cool containers I find at thrift and dollar stores, I think there are a lot of possibilities. There is room for creativity here! 1. 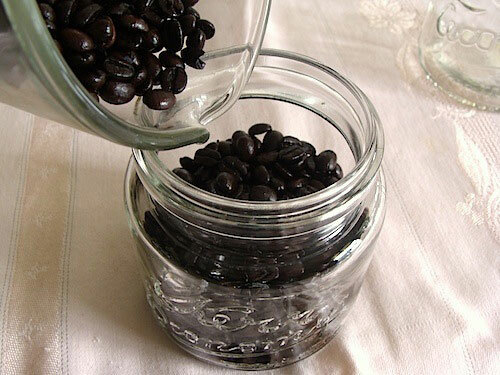 Fill each container with about a cup of coffee beans. I think I may have used 1-1/4 cup. The goal is to fill the container about half-way full with the beans. 2. 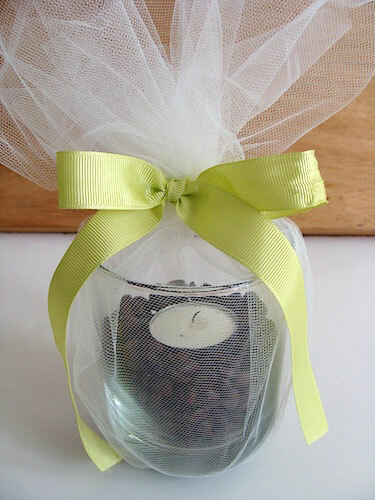 Nestle the tea light into the center of the beans and finish the gift by wrapping as desired. See? Quick and easy! 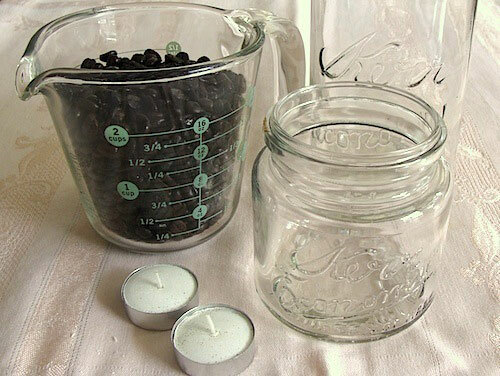 Use a vintage wide-mouth canning jar for the bean candle. Attach a zinc lid and wrap with garden twine. Use a dollar store candle holder and wrap with a large square of tulle held together with a colorful bow. What ways would you customize these candles? Get inspired by more than 300 gift ideas perfect for any gift giving occasion! Awesome!!!! I have made some candles with epsom salt instead of coffee beans and they look like glittering snow. I can’t wait to try coffee beans. YEAH!!!!! My husband and I were just laughing at ourselves the other day for buying 25$ candles when we were broke and newly married. What were we thinking?!? What else were we supposed to do with those handy dandy credit cards? Cool idea! I love coffee, candles and a bargain! I taught preschool for 7 years and received many candles as gifts. This is a lovely new twist!! This is such a great idea, so I tried it today, and it DID smell like coffee. HOWEVER, I left the room for a short while to put some clothes away, and the coffee beans caught fire! The smoke alarm went off, thank God, and I easily put them out. Had I not had a smoke alarm, though, the flames were high enough to catch something else on fire! Just wanted to give all of you a heads-up to watch carefully and do not leave the room if you try this. I did this today and my glass candle holder shattered and broke. At least I had it sitting on my stove and no fire started. The beans get really hot and this can actually be a fire hazard. Having witnessed 4 house fires on my street in 10 years, I will NOT be doing this again! Could try with flameless candle, the smell would not be so strong but would be a lot safer. Wonderful aroma and great gift or use for gatherings. Best suggestions are use flameless candles…. Tea lite candles …..tempered glass or even better a small iron skillet it tin. 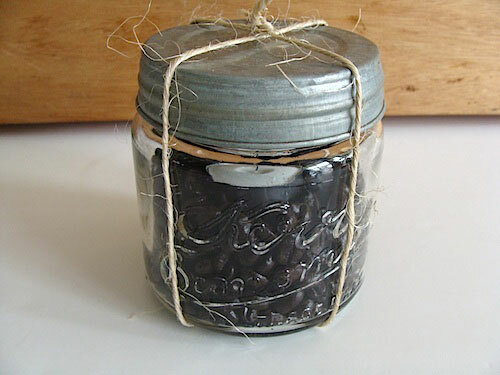 Other suggestions are use pillar candles and a plate of beans for the sent use vinilla candle and beans of your choice.